Haida Gwaii, once known as the Queen Charlotte Islands, is an archipelago of more than 150 islands located off the coast of Northern British Columbia, Canada. The islands have gained a reputation for breathtaking natural beauty and a remarkable First Nations culture. For thousands of years, the islands of Haida Gwaii been inhabited by the Haida, an indigenous people to whom art, culture, legends, mythology, and community played an important role in their lives. Argillite carvings, totem poles and ancient Haida villages attract visitors from around the world. This incredible area of British Columbia was formally called Queen Charlotte Islands until the Haida Gwaii Reconciliation Act officially named the islands Haida Gwaii, which means �Islands of the People�. Wildlife viewing and eco-adventures are popular in Haida Gwaii. Visitors can watch various birds or catch site of migrating whales or seals and sea lions. World class fishing lodges and coastal resorts in Haida Gwaii offer saltwater and salmon fishing adventures that are among British Columbia's finest. Plus, the many freshwater streams offer excellent flyfishing and stream fishing. Hiking, biking and walking on the beaches or numerous trails provides enjoyment as well as relaxation for the outdoor enthusiasts. Haida Gwaii can provide something of interest to everyone; history, archeology, fishing, boating, hiking, biking and more. The four main towns Masset, Queen Charlotte City, Sandspit and Skidegate, and numerous communities scattered throughout the islands all have something unique to offer. The island pace is slow and relaxing so you can explore and enjoy at your leisure. 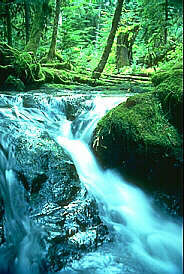 The Gwaii Haanas National Park Reserve and Haida Heritage Site are located on the southern part of Moresby Island. 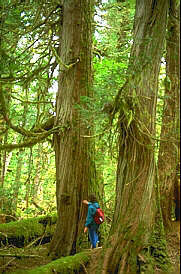 Appropriately, Gwaii Haanas means �Islands of Beauty� and is protected under Gwaii Haanas Parks. Access: To reach Haida Gwaii, you can travel from Prince Rupert by air or ferry. The trip by air is about 45 minutes; the ferry crossing takes about six hours from Prince Rupert to Skidegate. Direct air service from Vancouver is also available with flights arriving and departing from the airport at Sandspit. Once on the islands there are various charter boat operations to take you exploring or fishing. Accommodations: There are parks/campsites in and around Sandspit, Queen Charlotte City, Tlell, Port Clements and Masset. There are a variety of other accomodations from motels and hotels to guest lodges throughout the islands.